Internet performance analytics company Ookla, which runs the Speedtest.net website, has released results of its annual speedtest report in Canada. 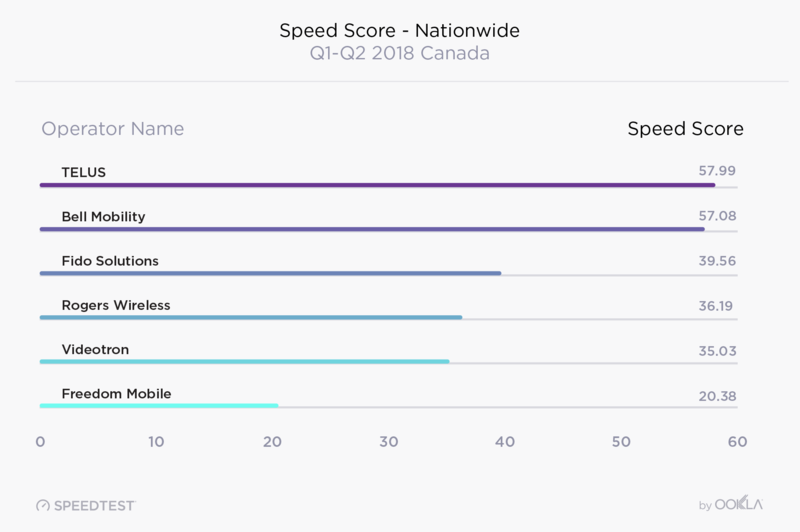 According to the report, of which the results can be read on Ookla’s website, Vancouver-based national carrier TELUS has the fastest mobile network in Canada — if only by a very small margin — with a Speed Score of 57.99 Mbps across the country. Montreal-based national carrier Bell came in at the second spot with a barely-slower average network speed of 57.08 Mbps across the country, followed by Fido at 39.56 Mbps, Toronto-based national carrier Rogers at 36.19 Mbps, and Quebec-based regional carrier Videotron at 35.03 Mbps. It’s important to keep in mind that Ookla determines its speed score by factoring in a carrier’s download and upload speeds from the 10th, 50th and 90th percentiles, then using a combined score for a weighted average using a 1:2:1 ratio. As far as overall network speeds in Canada go, the country’s mean download speed over mobile was 46.96 Mbps in Q1-Q2 2018, a 40.8% increase over Q1-Q2 2017. The mean upload speed for mobile was 11.85 Mbps, up 15.8% over the same period the year before. 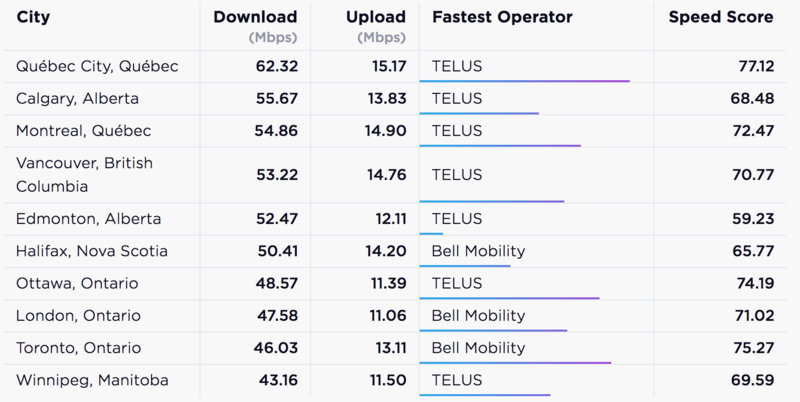 TELUS, along with Bell, was able to snag the top ten spots for the fastest mobile internet download and upload speeds in Canada’s 10 most populated cities. Note that TELUS took the top five spots. “Canadian mobile customers enjoyed some of the fastest average download speeds in the world during Q1-Q2 2018,” reads an excerpt from Ookla’s report. Earlier this week, PCMag in their annual test of Canadian wireless carriers, crowned Telus as having the fastest wireless network for the second year in a row.